Like people everywhere, the people of Israel seek to live in peace, and to see their children prosper. For the Jewish People, who have suffered centuries of exile and persecution, our dream can be summed up in the words of our national anthem, - �To live as a free Tragically, since the establishment of the State of Israel, every Israeli in every generation has been touched by war and by terror. Distinguished representatives, I have experienced first-hand the price of war. We all hope, we all pray for peace with our neighbors and we will do all that we can to achieve this noble goal, but we will never compromise the security of the Jewish State. Today I address this chamber at a time of great difficulty and pain in my country and for my This is not how I envisioned my first address, here. Over the past six weeks, the streets of Israel have been swept by a savage tide of terror and I am disappointed that all I hear are calls to end the cycle of violence. Let me make one thing clear - this is not a cycle of violence. These are simply unprovoked attacks against Israelis for no reason other than the fact that they are Jews living in their historic Like any country, Israel has the right and obligation to defend its citizens and this is exactly what Any country, any country, whose people were being attacked in the streets on a daily basis would act in the exact same way. Since Rosh Hashanah, the Jewish New Year, Israelis have endured a season of sorrow. Men, women, and children have been maimed and killed on the streets of Israeli cities, in broad Palestinian terrorists have chosen Israeli victims at random, using rifles and rocks, butcher knives, screwdrivers, and even two ton vehicles to shed the blood of innocents. Israelis today know that an attack can come at any time, in any place, without warning, and From Haifa to Beersheva, from Tel Aviv to Jerusalem, Israelis walking through their own neighborhoods are constantly looking over their shoulders, to see what will come. People are afraid to stop for coffee on the way to work, or even to take a public bus. All of us here have families. Mothers and fathers worry that their children could be knifed to death when they leave the house, and children are worried their parents won't make it home. This is the true meaning of terror. When someone leaves their home holding a kitchen knife with the intention of killing another person � any person � this stems from deep hatred. When that someone is thirteen, a thirteen year old boy, who stabs an Israeli boy riding a bicycle fifteen times, fifteen times, � this stems from a culture of hate. Nelson Mandela once said, �No one is born hating another person� People must learn to hate.� Tragically, Palestinian children have been receiving lessons in hatred from their leaders, in their schools, and on children's television programs. A children's program was aired on The Palestine Public Broadcast Corporation media station, it's called, Palestine This Morning, in which a young girl recited a poem calling to kill Jews, and I'm Quoting, "barbaric monkeys," and "the most evil among creations," and those "who murdered She concluded, �I do not fear barbarity� as long as I have my arm and my stones.� � Public. 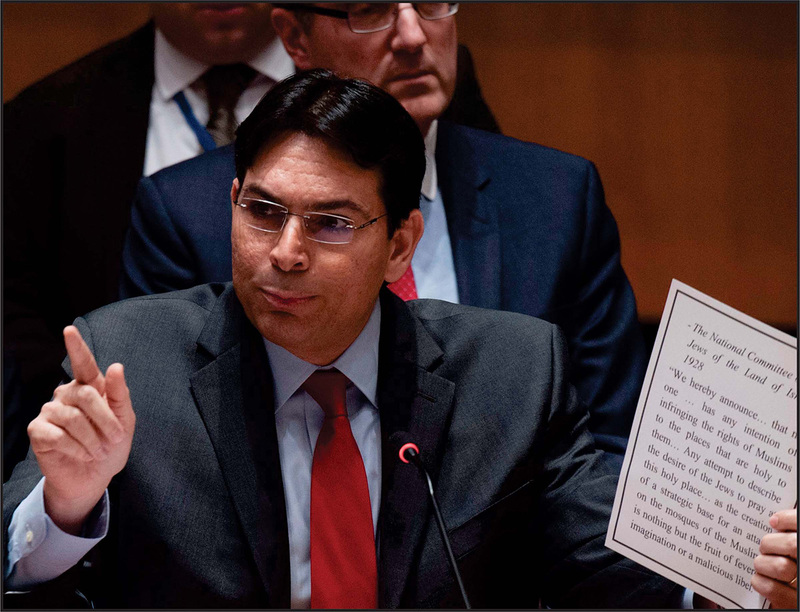 As we saw, here in this room, in last week's emergency session of the Security Council, many seem to be confused about the cause of the current escalation. Here, in the words of this young girl, you have the answer: An entire generation of Palestinian youth is being brainwashed with bigotry, brought up to glorify violence, and raised to This indoctrination poisons the minds of the youth, and the results are only a Google search Just take a look, not now, but take a look at what is trending on Palestinian social media: There are vicious cartoons showing brutal killings of Israelis, There are instructional videos for how to commit a terror attack in the most efficient way, There is even an animated clip of the murder of Eitam and Na'ama Henkin � Israeli parents who were killed in front of their children. Since most of you have not seen this clip, let me tell you that a special effort was made to show the fear and terror in the eyes of the Henkin children who were sitting in the back seat of their car as they watched their parents being murdered. It's no wonder that in this current wave of attacks, at least nine of the attackers have been Palestinians under the age of 18. When you ignore this deliberate corruption of the minds of children, you are not a part of the solution � you are a part of the problem. The history of my region demonstrates that hatred starts with falsehood and incitement, and ends The spree of stabbings, shooting, and stonings we now face began with lies, lies about the President Abbas, and the Palestinian leadership have repeatedly and systematically accused Israel of trying to change the status quo. This inflammatory allegation is false, and President Abbas knows it is false. Yet, this deliberate and malicious lie is told over and over again. Not only is this conspiracy theory not true, but it is also not new. Allow me to quote the following: �We hereby announce� that no one � has any intention of infringing the rights of Muslims to the places that are holy to them� Any attempt to describe the desire of the Jews to pray at this holy place� as the creation of a strategic base for an attack on the mosques of the Muslims, is nothing but the fruit of fevered imagination or a malicious libel.� Do the words I read sound familiar? The statement I have just read to you was not issued last week. It was not even issued last year. It was made in 1928, 1928, by the National Committee of the Jews of the Land of Israel. Even then, 20 years before the establishment of the State of Israel, lies were spread about the Temple Mount in order to incite violence against Jews. In the violence which followed, back then, one hundred and thirty three Jews were massacred and hundreds more were injured. Today, when President Abbas declares, and I quote, �Israel intends to make Al-Aqsa Jewish� and says, �We welcome every drop of blood spilled in Jerusalem�, he understands the consequences of his words; he knows full well that it leads to new waves of violence and terror, and that lives will be lost. Then, as now, the story is the same: same plot, same characters, same ending. Actually, there is one major difference: In 1928, the �convenient� explanations we so often hear in this chamber, didn't apply. In 1928, there was no Israeli presence on the Temple Mount; And no excuses to sell to the international community. Whoever claims that Israeli actions and policies are the reason for the violence needs to learn a The Palestinians are employing old tactics and are trying to score easy victories without having to negotiate, without negotiation. They are using the violence they incited and instigated in order to manipulate the international Instead of penalizing the Palestinians, the international community is rewarding them. Israel is fully committed to the status quo. Under this agreement, Muslims are free to visit and Members of other religions, including Jews and Christians, may only visit, may only visit and they can do so only on weekday mornings between seven and eleven o'clock. Israel not only accepted this arrangement, it is responsible for enforcing it. The facts speak for themselves. Let me share with you some numbers. Every year, there are approximately 3.5 million visits by Muslims, who come to pray in the Al-Aksa mosque, and 80,000 non-Muslims visit the site, of which only 12,000 are Jews. The status quo on the Temple Mount is the only guarantee for freedom of religion in Jerusalem. We've said it before and we'll say it again: Israel will not agree to an international presence on the Temple Mount. If the international community wishes to be constructive, it should focus on ending the No nation represented in this chamber would accept the presence of international forces in their I would like to say to my colleague, the French Representative, we know that your country wants to see peace in our region. We too want peace, but the only way to peace is with direct talks It is the only way. It was proven in the past and it's the only way to promote peace. The best way to reduce tensions in the region is to urge President Abbas to accept Prime Minister Netanyahu's call to meet with him, here in the UN, in Jerusalem, in Ramallah, wherever. Israel opposes any change in the status quo on the Temple Mount. The place where the status quo needs to change is here at the UN. If the UN is truly interested in calming tensions and bringing peace to the region, it must change The UN must end its usual practice of calling on both sides to show restraint, and state clearly: there is one side that is instigating a wave of terror. Stop making excuses for the Palestinians, and start holding them accountable. Demand that President Abbas cease his incitement. Insist that he return to the negotiating table. Only then, once the Palestinians see that promoting violence will get them nowhere; will the reality on the ground change and the prospects for peace return.